Diamond "In mineralogy" is a metastable carbon allotrope, in which carbon atoms are arranged in a variation of the cubic crystal structure. Diamonds are known as materials with superlative physical qualities, most of which come from strong covalent bonds between atoms. In particular, diamonds are the hardest type of precious stone which has a value of 10 from the 10 Mohs scale and thermal conductivity of various bulk materials. Diamonds are attractive minerals. It is chemically resistant and it is a natural substance known to be the most difficult. This property makes it suitable for use as a cutting tool and for other purposes where durability is needed. 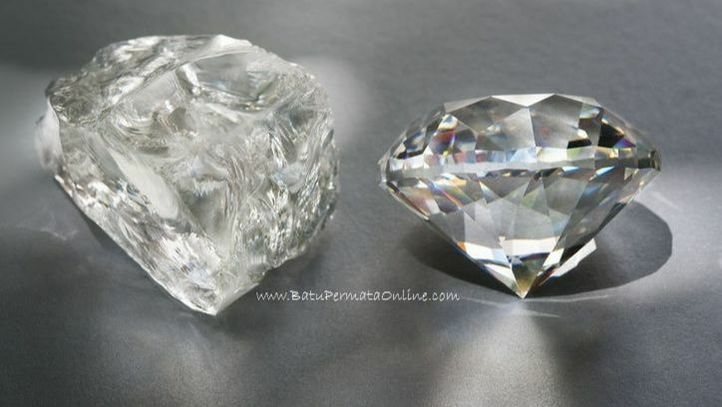 Diamond also has special optical properties such as high refraction index, high dispersion and high luster. This property helps make diamonds the most popular gemstone in the world. Authenticity is a bit of a mystery. They consist of elements of carbon and therefore many people believe that diamonds are formed from coal. Though that is not true. In addition, Diamond is one of the most expensive gemstones which is caused by very rare stones and has a sparkle or can emit light. There are also colored diamonds such as Blue Diamond, Yellow Diamond and Black Diamond. Diamond mines are found in Africa. In Indonesia also has a Batu Intan mine which is in Martapura (Borneo island). Diamond symbolizes purity, glory, prosperity and power for the wearer. Diamonds are formed at high temperatures and the pressure that occurs in the earth's mantle is about 100 miles down. Most of the Diamonds that have been found are sent to the surface of the earth with deep-source volcanic eruptions. This eruption begins on their mantle and journey until they tear off pieces of stone mantle and deliver them to the surface of the earth without melting. This block of the mantle is known as xenoliths. They contain Diamonds that form at the temperature and high pressure conditions of the mantle. People produce diamonds by mining rocks containing xenoliths or mines of soil and sediments that form as rock-bearing rods. Some diamonds are estimated to form under conditions of high pressure temperatures from subduction zones or asteroid impact sites. Some are sent to earth in meteorites. No commercial diamond mines have been developed in deposits with such origins. Diamonds become one of the most valuable tertiary goods a person can have. If you save it as an investment in the future, its value will continue to climb. Understandably, diamonds include rare and expensive items because it is not easy to mine them. No wonder potential investors need to recognize diamonds further to get the best quality as an investment. Of one raw diamond earned from mining, only 40 percent are declared qualified without a lot of fingerprints and can be judged to be used. While 60 percent is wasted or made as a diamond sharpening plate. Natural fingerprint is another term for a less than perfect diamond condition. His lay language is a flawed diamond. But diamonds include high-value luxury precious metals. The process of making and originating from the ground with hundreds of meters depth, making diamonds contain natural fingerprints inside and not on the surface. Color: Most diamond quality gems range from colored to yellow. The most highly respected stones are those that are completely colorful. These are the ones that are sold for the highest price. However, other categories of gem diamonds are increasing in popularity. It is a "luxury" diamond, which occurs in various colors including red, pink, yellow, purple, blue and green. The value of these stones is based on their color intensity, scarcity and popularity. Cutting: The quality of work on a diamond has a great impact on quality. It affects not only the geometric appearance of the stone but also the luster of rock and fire. the ideal stone is perfectly polished to be highly reflective and radiates the maximum amount of fire. The same faceted faces are in size and identical in shape. And, the edge of each faceted face met perfectly with each of its neighbors. Clarity: The ideal diamond is free of internal weakness and inclusion (particles of foreign material in stone). This reduces the appearance of the stone and interferes with the passage of light through the stone. When present in large quantities or sizes they can also reduce the strength of the stone. Carat: Diamonds are sold by rust (units of weight equal to 1/5 gram or 1/142 ounces). Small diamonds cost less per carat than larger stones of the same quality. This is because very small stones are very common and large stones are especially rare.